It is shaping up to be a great weekend weather wise, so get out there with your net or camera if you can! It is a good time to see big numbers of our migrant species – Red Admirals and American Ladies should be present just about everywhere in big numbers. Dwayne Sabine reported this morning that Red Admiral numbers in Fredericton are now the highest they’ve been all spring, and Martin Turgeon reported having 49 in his yard just before lunch, the most he’s ever had in the 30 years he’s lived there! See if you can’t spot Painted Lady this weekend as well. 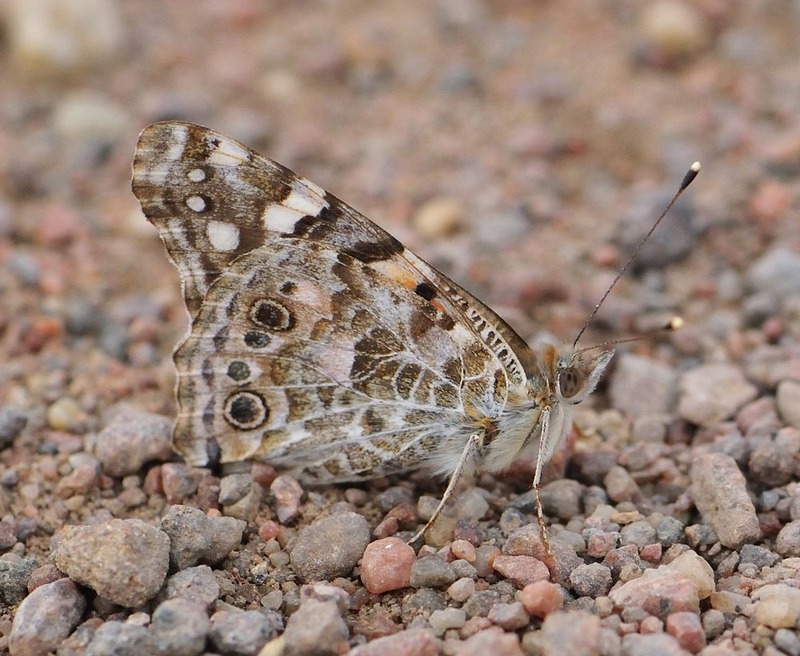 Unlike the more common American Lady that has two really big eye spots on its hind wing, Painted Lady has a series of smaller eyespots (see photo below). Painted Ladies will be present just about everywhere too, you just might have to check a few butterflies before you find one. You could also find the Maritimes first Monarch of the year. They have been present in southern Ontario for a couple weeks now, so we are overdue. Keep your eyes out also for our resident spring fliers. I probably sound like a broken record, but now’s the time to find elfins. Ken McKenna got Hoary Elfin near Cardigan Head, PEI, earlier this month. That is only the second location the species has ever been found on the island! Be sure to check out any small dark butterfly you see along woods roads and in and around boggy areas.